Check out that fridge! 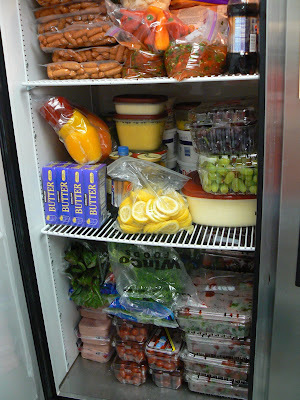 I was shocked at how quickly we filled this empty refrigerator. 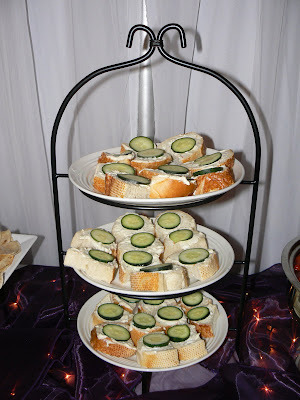 Those cucumber sandwiches were my personal favorite - so easy and delicious. I think it's the dill sprinkled on top that calls to me. And this is how we looked by the end of the night. Not too bad, right? And do not fear - we did not do it all alone. We had some cheerful helpers through the night. Kari's daughter Kaleigh was there most of the night, as was my excellent mother-in-law, Karen. Sis. Isenberg and Sis. Champlain were also there. We had a great clean up crew at the end of the evening too. Thanks to my parents, Karen & Doug, Robb, and Sis. Champlain for getting us out the door so quickly. We were on our way in just an hour! It was a happy, hopping, hard working kitchen and a great experience for all of us. That food sounds and looks so yummy. I'm sorry I forgot to call you about piano last week. We were out of town and for some reason it fell right out of my head. We will see you on Wednesday though! Wow! That does sound yummy! Where were you when I got married?? It all looks SO good! Good job Jennifer and Kari. I'm impressed!!! I want to eat those strawberries!